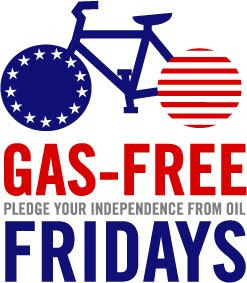 Greater Philadelphia Bicycle News: Gas Shock Mania - Has "Drill Baby Drill" bored common sense out of our heads? Gas Shock Mania - Has "Drill Baby Drill" bored common sense out of our heads? As we head to the National Bike Summit going face to face with a new Congress one would think that we were going in with the wind at our backs. Unrest in the Middle East has caused Gas prices to spike to near June 2008 levels. The largest oil spill in history has left unknown damage in the Gulf of Mexico and Shale Gas fracking has been linked to tainted water supplies in Northeast Pennsylvania and earthquakes in Arkansas. Encouraging people to Bike, walk or take public transportation for some of their trips is common sense, like investing in savings instead of of over-extending your credit card. AAA didn't successfully get rid of the Pennsylvania Avenue bike lane but it was able to pare down it's buffer and possibly contributed to a defeat of a pro bicycling Mayor. The success of the cycle track on the West side of Prospect Park in Brooklyn has raised the ire of Democratic Senator Chuck Schumer and former bike supporter Rep. Anthony Weiner who declared that if elected Mayor he would have a ribbon cutting for tearing out the (f-ing) bike lanes. In Wisconsin Governor Scott Walker has proposed cutting bikeway funding in a state where the bicycle industry (tourism, manufacturing, sales etc.) supports 3400 jobs and has an economic impact of $556 million annually. And can anyone forget the Bike Share UN Conspiracy of failed Colorado Gubernatorial Candidate Dan Maes. The noise of the drilling seems to have drowned out the voices of reason. Perhaps we should recruit Charlie Sheen as a spokesperson to help get our message out. But in the end some people will choose to bike, walk or take public transportation simply because it makes good sense. Ride your bike - for your economic and physical well being and for your country.